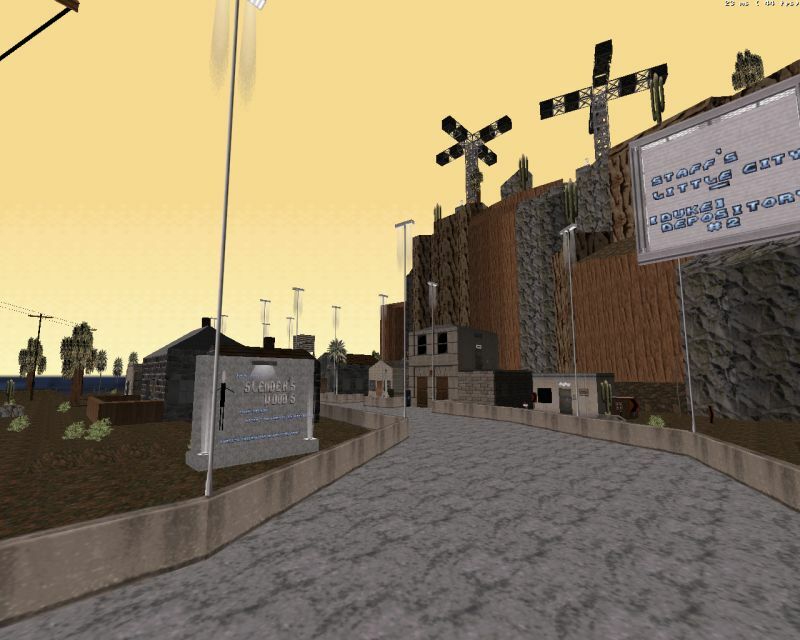 Description: The physics-illiterate might say that Sanek has taken a bit of a "quantum leap" with this map. Design-wise it's certainly a lot more ambitious than anything he's come up with before. 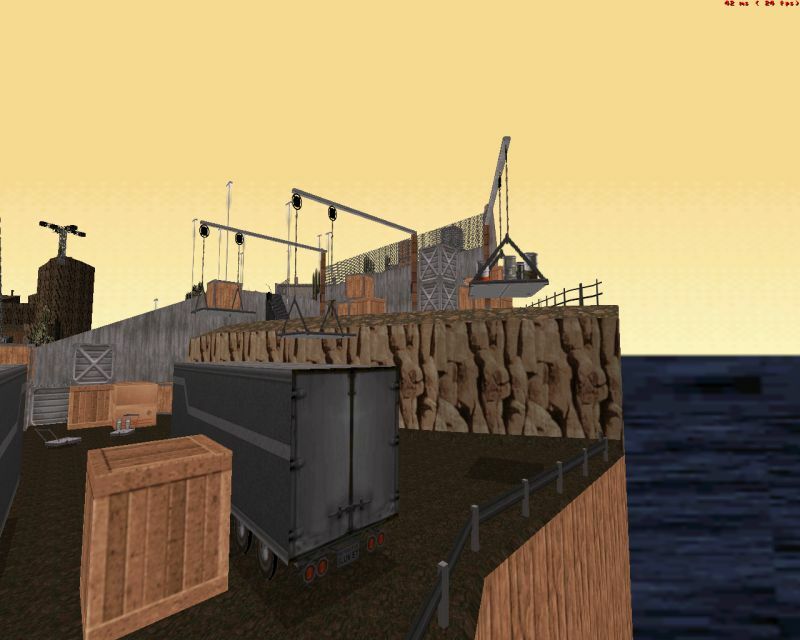 Bridge Between Two Islands is a medium-size canyon/town map that takes place in a huge open environment. Into It: Duke starts off at the bottom of a mountain. You're briefed (in clumsy English) and then it's time to get going, starting with acquiring weapons and getting a sense of where you are. The sheer size of the area might disorient at first but the gameplay area is in fact quite small and simple to navigate. In order to get to the second island you have to find four buttons that have been scattered around the first, which might seem a bit cheap but their locations are, in a fair move, revealed by a viewscreen which should do away with mindless wandering. The map has an impressive design with good use of terrain and some far-away sprite structures that reminded me of my brilliant Hoover Dam map in DNF 2013. The bridge itself is a fantastic piece of work too. There are some problems though: The map is quite glitchy when viewed from certain angles with many sprites disappearing and reappearing. The biggest problem is performance: even Polymost, the fastest renderer, gave me a pitiful 20fps whenever looking in the direction of the bridge. The problem was only pronounced on the second island during some hectic combat situations. I'm also not very fond of Sanek's habit of breaking the fourth wall (which he did in Dayz of Our Lives too) since it eats away the immersion of being there. 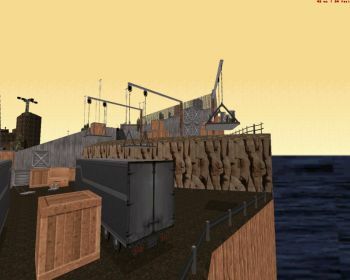 The map relies on respawning enemies and while their distribution is pretty fair on the first island where there are many buildings that you can use as cover, the second island is not only smaller but also more open, resulting in a pretty infuriating experience as you're being chased by dozens of hitscan enemies in a low-fps environment. Conclusion: In the design department Sanek has grown progressively better, and Bridge Between Two Islands is not only visually stunning but a nice break from Sanek's usually confined and repetitive maps. Unfortunately the map suffers from performance-related issues that exacerbate shortcomings in the gameplay department. Those who don't have to put up with low fps may add a point or two to the score.